The delicious food at Spago includes Pan Seared Alaskan Halibut "Laksa, "Frutti di Mare" Risotto and the Big Eye Tuna Tartare Cones (above). The delicious food at Spago includes Pan Seared Alaskan Halibut "Laksa", "Frutti di Mare" Risotto (above) and the Big Eye Tuna Tartare Cones. 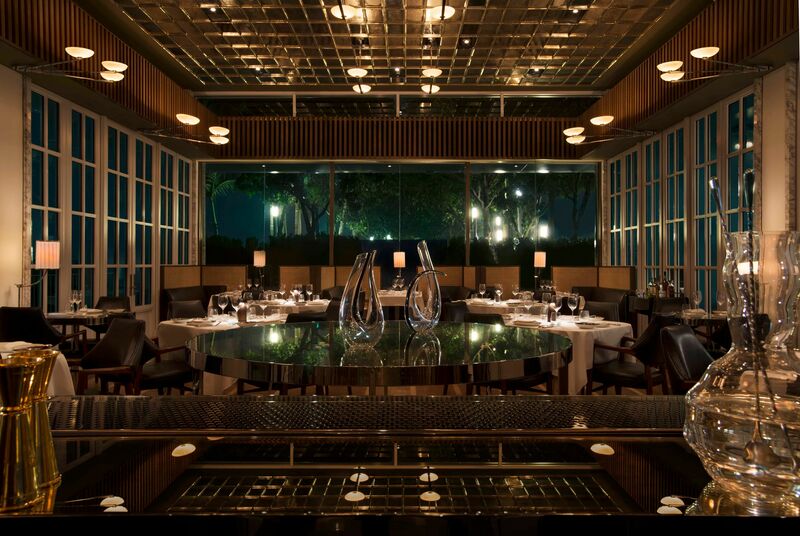 Another celebrity chef restaurant, Spago, has opened at Marina Bay Sands, but its list of celebrity chefs has not grown. That's because the three-week- old restaurant at the integrated resort's SkyPark is an offshoot of Spago in Los Angeles owned by Wolfgang Puck, who already has an American steak restaurant, Cut, in Marina Bay Sands. Spago, however, is very different from Cut. The food has influences from East and West, and, in the case of the new outlet, boasts inspirations from Singapore dishes such as kaya toast and laksa. Call it fusion, but there is no confusion. Instead of being gimmicky, the dishes are well thought out. I've been to the restaurant twice, on my own and then invited, and haven't had a bad dish - only good, very good and, in a few instances, excellent ones. The Pan Seared Alaskan Halibut "Laksa" ($42) is one of those dishes I would order again in a jiffy. The chunky haibut fillet is perfectly seared, with a golden crust that breaks under the fork to reveal smooth slivers of moist flesh. The sauce is more a cross between a curry and a laksa, with all the flavour and aroma of a good spice paste without the chilli burn. For more heat, you can add some sweet onion sambal, which is served on the side for chilli fiends. And in the gravy are short strands of thick bee hoon. The dish is created by executive chef Joshua Brown, who was formerly with Cut here and now heads the Spago kitchen, and is a good example of how a mishmash of cuisines can taste so right in the mouth when executed well. The "Kaya Toast" ($29) is less recognisable than the popular Singaporean breakfast. A piece of seared foie gras is served on a toasted brioche with a bit of pandan coconut jam, but neither the pandan nor the coconut is evident as the foie gras takes centre stage. A dollop of slow-cooked egg yolk and a foie gras-espresso mousse are nods to the soft boiled egg and coffee often eaten with kaya toast, but remain just that - nods. If you like foie gras, you'll be happy with the dish, but don't expect kaya toast of any sort. Some of the steaks from Cut - such as USDA Prime, Black Angus ($79) and Miyazaki Wagyu ($220) - are included in the menu here. But since I'd rather try something unique to Spago, I order the Seared Japanese A5 Wagyu Steak Salad ($52) instead. It is more steak than salad. My dining companion and I have three slices of wagyu each, which is just the right amount I want for a starter. It is delicious, but any more of the fat-laden meat would spoil my appetite for the rest of the meal. To balance the fat, there is the accompanying salad of bamboo shoot, myoga ginger, shiso flowers, gingko nuts and sansho pepper dressed with kinome (prickly ash leaf) aioli. The "Frutti di Mare" Risotto ($39) is like a hybrid of risotto and paella, with the al dente rice cooked with seafood stock flavoured with saffron. You get bits of lobster, shrimp and scallops stirred into the rice, but the bits of crunchy calamari, whose texture provides an interesting contrast to the grains, are what make a lasting impression. Some dishes are taken from the Spago menu in Los Angeles and the Crispy Scale Black Sea Bass ($46) is definitely a good choice. The crispy skin layered over the soft meat of the fish gives it an exciting feel in the mouth, as do the crunchy bits of bamboo clam and littleneck clams in the parsley-lemon sauce. It is a simple dish, but executed so well that it is faultless. The Grilled Colorado Lamb Chops ($88) come highly recommended and its high price certainly raises expectations. But I find the meat not much different from lamb chops that are much cheaper. The dish, which comes with charred eggplant caviar, tzatziki and harissa aioli, is good but not exceptional. The sides are good though. The Roasted Brussel Sprouts, Shiro Miso, Yuzu Citrus ($18) is so delicious that it may well make instant fans of the vegetable - especially with the delightfully crispy puffed rice sprinkled over it. There is also the wonderful Pommes Aligot, which is not available on its own but served together with the USDA Prime Cote De Boeuf ($175 for two persons). I got a bit of it, courtesy of the chef, and I suppose you can try and ask if you can order some. It is mashed potato blended with different types of cheeses, resulting in a gooey texture like an exceptionally thick fondue. On the plate, it forms a lump like muah chee that you can cut with a fork, but in the mouth, it dissolves almost instantly, leaving a lingering flavour of the cheeses. It's much lighter than the usual mashed potato too. You must leave room for the Salted Caramel Souffle ($24), which is marvellously light. It has the flattest top I've seen in a souffle and bits of the edges are crispy. A Fuji apple sorbet is the perfect accompaniment, providing the acidity to cut the sweetness. This is going into my list of unforgettable desserts. Spago's interior design is as eclectic as its food, with simple white French windows on two sides instead of walls to allow diners a view of the bay. The ceiling, however, is covered in luxe gold tiles. The adjoining lounge terrace is much more visually coherent, with little cabanas, plush cushions and plants creating a comfortable, garden-like space to relax in. It serves a different, lighter menu and will open for lunch as well from next month. Lunch in the main dining room, however, will be introduced only later. • Life paid for its meals at the eateries reviewed here.